This is a very interesting specimen whose unique foliage commands attention in the landscape. Horn like scales hug tightly to the branchlets, providing a slightly chunky texture. Creamy white color splashes in the foliage add great accent to the landscape. 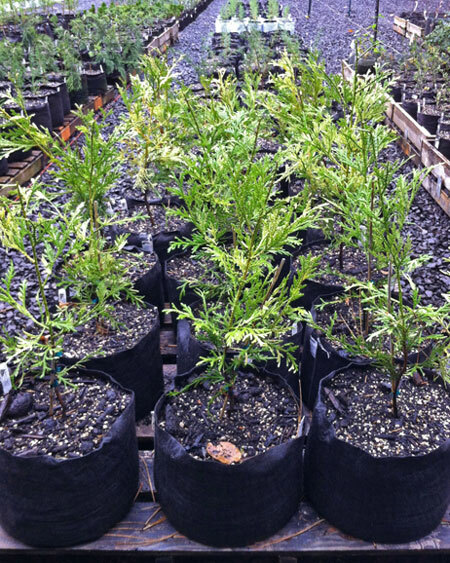 Growing slowly up to 10 to 15 feet tall with a slightly smaller spread, this shrub exhibits a broadly pyramidal form, keeping its foliage all the way down to the ground. Plant in full sun to partial shade in rich, moist, well drained soil. Water regularly as it doesn't like to dry out! In hotter areas, plant in a location that provides a break from the sweltering mid-day summer sun.